Whether you know how to use it well or not, there’s one thing to be said about technology: it’s everywhere. You’re using technology to read this very article, you use it to stream your favorite music, and you use it to stay in contact with the ones you love the most. Here at Blue Water Dental of St. John’s, Dr. David Sorensen uses technology to take images of the teeth and mouth to offer patients with the proper diagnosis. Let’s take a closer look at the three types of imaging we use and why they are beneficial. Because taking a selfie with the inside of your mouth is practically impossible, we have found the next best thing: intraoral cameras. This type of technological dental device is used to get a closer look at the inside of your mouth that a dentist is unable to see with a dental mirror alone. 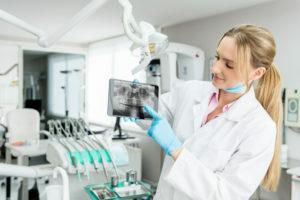 These intraoral camera images allow the dentist to view the teeth, keep a record of the teeth to be used as a comparison, and use them to create before and after photos for patients. Additionally, intraoral cameras can also be used to speed up the insurance-claim process. Digital imaging like x-rays gives Dr. David Sorenson the ability to look at your teeth and jaw to give you the proper diagnosis and treatment plan. Unlike older x-rays, technology allows us to get the results back in several minutes which means that you won’t have to come back or wait around for your results. Additionally, our x-ray system cuts down radiation exposure by 50 percent. Most of us know what it feels like to leave the dentist with a mouth so numb that you can’t even drink a glass of water without drooling. Luckily, with our Single Tooth Anesthesia (STA) System, we can administer anesthesia into the targeted tooth or area of the mouth without having to numb your entire mouth. Using the right technology can give you a faster, more accurate diagnosis. If you want to learn more about our technology or schedule your next dental appointment, contact Ponte Vedra office today: (904) 395-7771.